It has been 311 years since the UK Government managed to sadly bribe some Scottish Government members to trade away Scotland, in return for land and titles. During that time, the UK Government has taken tens of trillions of pounds in taxes and natural resources. If you were to estimate the value of the amount of taxes collected from the people of Scotland by the UK Government over the last 311 years, it would be better to give a value that reflects the current exchange rate. In order to do that, let's take the amount of tax revenue raised in Scotland this year, and multiply it by the 311 years that Scotland has been colonised by the UK. This would give us a more accurate figure, in terms of today's value of past wealth. The result of this calculation is quite shocking - and comes to a massive £19 trillion. Now if you add the value of Scottish oil and gas that has been extracted from the North Sea in the last few decades, you can add another £2 trillion to that tally. Now of course, I have been extremely modest here. The British Government has also acquired massive amounts of land in Scotland, and many other assets that I couldn't even begin to place a value on in this article, so let's stick with what is most obvious - tax revenues, and oil and gas. In reality, in today's money, perhaps the figure of stolen goods and property from Scotland could actually be far higher than my estimate. And the theft won't stop after Scotland becomes independent. 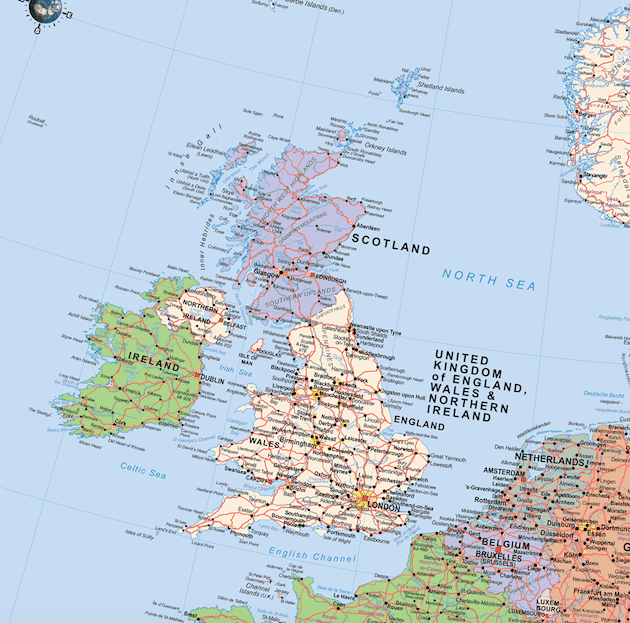 The British Government have actually redrawn the sea boundaries so that they can continue to steal Scottish oil and gas after Scotland eventually takes her independence. How do I figure that this money has been stolen, you may ask. Well, let's not forget, when the UK Government colonised Scotland in 1707, the people of Scotland did not approve, in fact it is widely believed that the vast majority of Scots disagreed with the Act of Union. Scottish politicians at the time were simply 'bought and sold for English gold' in the great words of Scotland's greatest poet Rabbie Burns. All of our tax revenues and assets then became property of the British state upon the Act of Union - and without permission from the people of Scotland - the rightful owners of these assets. If taking something without permission isn't theft, then I don't know what is. But perhaps the greatest things that have been stolen from Scotland do not have monetary value - the pride of a nation, our proud culture, our history, our language? Perhaps the theft of these things is an even greater scandal? Perhaps it's also a greater scandal, that whilst being a colony of England, Scotland's population growth has been stunted, that our economic growth has been stunted, and that our country has been denied of achieving it's full potential, in the same way that India's economic potential was in a stranglehold while under British rule? It is believed that the British Government stole $45 trillion from India during the time that they had colonised it, in today's money. Again, this is a very conservative estimate. The entire reason that the UK became one of the world's largest economies, is because they simply stole massive amounts of land and assets from other countries around the world. But the empire sadly still holds onto Scotland - one of it's most prized colonies, a country that it couldn't steal by force, and so had to acquire it through the corrupt 'Act of Union.' Thankfully, the people of Scotland are now waking up to this blatant theft, and are beginning to realise their worth. The isolationist ideals of the UK Government and the lies and threats of the unionist establishment have ensured absolutely, that Scotland will achieve independence in the foreseeable future. And when we finally walk out the door, I do hope that they reflect on the fact that it was their contempt for Scotland that has caused this situation to unfold. We wish England and what remains of the United Kingdom well as we leave, and prepare to become an independent country again, but it's difficult to pretend that the feeling is mutual. It actually kind of feels like we've being kicked out the door. Back during the first independence referendum campaign, all kinds of threats were thrown our way by the no campaign. "We'll stop you from using the pound," they said. "You won't get your pension" they suggested. "You won't survive without us" they said. "We'll throw up a hard border" they threatened. "We won't buy your exports" they suggested. "You'll be forced to leave the EU if you vote for independence" they threatened - well look how that worked out for us. They told us that we'd face uncertainty if we voted for independence. And now it is clear that independence is the only way to avoid perpetual uncertainty in the UK. They told us we'd face job losses if we voted for independence - and the opposite was true - now we face tens of thousands of job losses by remaining a part of the union - because of Brexit. They said there would be a hard border - they've now proven there would be no need, after showing their willingness to bend over backwards to avoid one in Ireland. They said a no vote would lead to further meaningful devolution - yet here we are with the powers of the Scottish Parliament now under threat as a result of the power grab. They said Scotland would lead the UK, yet here we are, our voices ignored and English Votes for English Laws ensuring that Scottish MPs now have no power over matters that affect England, but English MPs still have the overwhelming majority of votes in matters that affect Scotland. I mean the very idea that the UK would even suggest that they'd even be able to stop buying our exports after independence is frankly laughable. Where will they get these things from? Further afield? Good luck to them! But we all know, they'll continue to buy our exports after independence, in the same way that they still buy Irish exports. So the idea that this business relationship will somehow end overnight with independence is disgustingly misleading at best, and a total pack of lies at worst. More recently, Tory MP David Mundell has said that "Scotland is not a partner of the United Kingdom, it is a part of the United Kingdom." When Scottish tennis star Andy Murray backed Scottish independence in 2014, the unionist media attacked him for making his feelings clear. Murray said at the time via his twitter account, "Huge day for Scotland today! No campaign negativity last few days totally swayed my view on it. Excited to see the outcome. Let’s do this!" So there's absolute proof that the anti Scottish bias, and negativity has actually fueled independence support. And of course the Little Britain direction being taken now by the UK, forcing Scotland out of the EU against it's will ensures that support for independence is now between 53 and 59% depending on how Brexit plays out in March, according to the very latest polling figures. The UK is literally pushing Scotland out the door - it's not the other way around. The complete lack of respect for Scotland's position during the Brexit negotiations has pushed more and more people towards backing independence, with the overwhelming majority of polls showing increased support for indy since the 2014 referendum. Prolific unionist Sir Billy Connolly has even changed his mind on independence due to the UK's desire to cut itself off from the rest of the world. He told the media recently "The Brexit vote is a disaster and the breaking up of the togetherness of Europe is a crime bordering on a sin. I think the more people are together, not separate, the happier they will be. The most important thing for Scotland is to keep our contact with Europe. Scots voted to stay in Europe, and if the only way for us to do that is to become independent from England, that may just be the way to go. And I never thought I would say that." If Billy can change his mind, then frankly, so can anyone. He is proof that even the most die hard unionist can be brought around to the idea of independence in the right circumstances. And this Christmas, Scots had to face up to the fact that they were being lectured on unity by an unelected, hereditary head of state, sitting in front of her gold piano, in lavish and luxurious surroundings. This adds insult to injury, to the people of Scotland, who are already feeling undervalued in the so called "union." Brexit will bring economic disaster to Scotland and a possible recession, with the loss of thousands of jobs expected in the coming years - and we voted against this insanity. There's been special treatment for Northern Ireland and even little old Gibraltar, but not for Scotland. The Claim of Right, allowing the people of Scotland to make constitutional decisions for ourselves has been cast aside by the British Government in recent times. If there was ever an illusion that Scotland's voice was ever treated with respect, we can all agree, that illusion has now died. The British establishment continues to show complete and utter contempt to the people of Scotland, and disregards the fact that Scotland has distinct interests. They have tried to kill off Scotland the brand, by forcing companies to label Scottish produce with union flags. Inflammatory language is often used to describe anyone who has the legitimate feeling that Scotland might be better off as a normal, independent country, like all the other countries in the world. They call us separatists and nationalists for example. The word separatist is such a negative word to describe something which is actually altogether positive - the idea that a country should stand tall, as an independent nation, and have the power to run it's own affairs, rather than have a foreign country do so. Perhaps the UK Government's strategy now is to put Scotland down so much that we'll eventually fall into line, and do as we're told, know our place and eventually we'll not dare to mention the fact that we'd quite like to have our voices heard and respected. Maybe the people of Scotland will eventually tire of feeling the need to be treated with respect and dignity? Perhaps that is their hope? I've got a feeling that 2018 was the last year that the people of Scotland were willing to be told what to do by a foreign government, and that the new year will bring about a fighting spirit that will lead us to independence. Scotland's capital city is preparing to celebrate Hogmanay, as tens of thousands of tourists flock to Edinburgh from all over the world to take part in the celebrations. The Edinburgh street party is one of the biggest in the world, and this year's event will celebrate Scotland's relationship with Europe, as the UK prepares to leave the EU in March. The vast majority of the people in Scotland voted to remain in the EU, so the theme represents the feeling of great loss that will be felt by millions of Scots who will lose their EU citizenship next year. Hundreds of thousands of EU citizens who have made Scotland their home are worried about retaining their rights after Brexit. 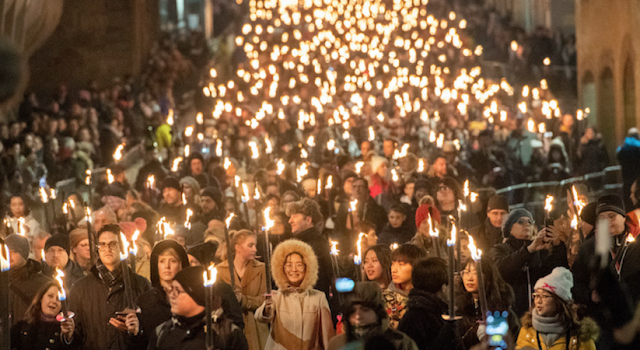 According to the official material advertising the three day event, "Edinburgh’s Hogmanay celebrates Europe and invites the world to share the love, embrace friends – old and new – and come together in the home of Hogmanay." The party will begin at 7.30pm and the main acts performing at the event include Gerry Cinnamon, Judge Jules and Franz Ferdinand, but many other acts will also perform to the massive crowds. All who attend the street party will be given a 'wee dram' of Johnnie Walkers Scotch whisky to ring in the New Year, so it could get pretty messy in the capital later on. Writers have taken part in a 'Love Letters to Europe' project, which will see letters projected onto buildings in Edinburgh between the 1st and the 25th January, leading us up to Burns Night. 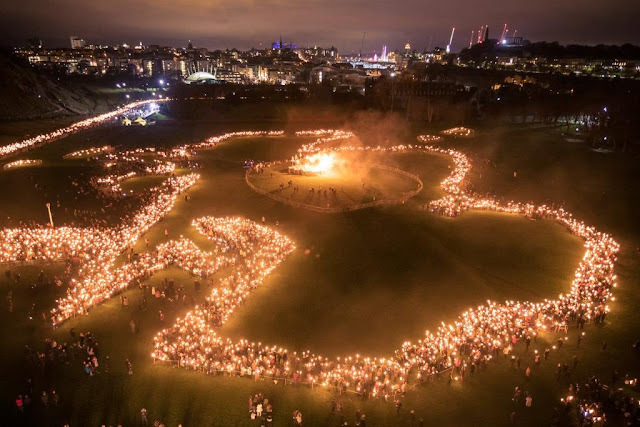 Last night, thousands of people took to the streets of Edinburgh to take part in the annual torch lit procession, with a massive burning outline of Scotland created by torch bearers at the end of the march near the Scottish Parliament. 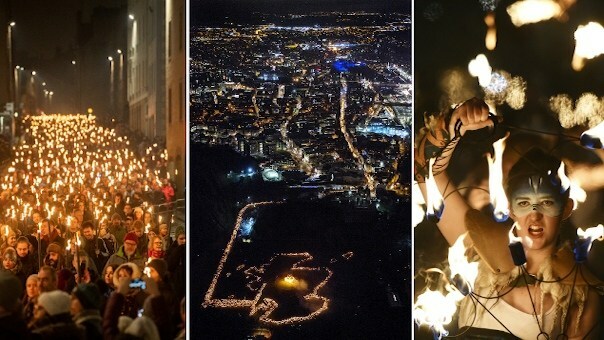 Above: some more impressive images from last night's torch lit procession in Scotland's capital city. There are those in the unionist establishment who would have us believe that the desire for self determination in Scotland is simply a recent fad, and that it might simply evaporate with the passage of time. In reality, this couldn't be further from the truth. How far back you go through the pages of our history is up to you, but scratch beneath the surface and beyond the Daily Mail headlines, and you'll realise that the most recent Scottish independence movement is one that's been slowly brewing for the last 100 years or more. In fact, even during the period when the Act of Union itself was signed, there was much protest against the union in the first place. In our recent history, back in the early 1900s, a Scottish revolutionary called John Maclean inspired many thousands of Scots to back independence. in April 1918, he was arrested for simply making a speech, and for being outspoken against the British state. He was released in the November of the same year. While in prison, Maclean took part in a hunger strike, but was force fed, which led to serious health problems, and his eventual death. He collapsed while making a speech aged only 44. In 1934, the Scottish National Party was formed. By 1945, the SNP had began to campaign for a Scottish Parliament, but the independence movement didn't see significant growth until the 1960s. Winnie Ewing would win the first seat for the Scottish National Party in 1967 in a Hamilton bi-election. By the 1970s, serious consideration was being given to the idea of independence, when it was pointed out that Scotland's natural resources were being effectively drained by the UK Government. in the October General Election of 1974, the SNP took 30% of the vote, and 11 seats out of 74 in the UK Parliament. In 1979, the people of Scotland voted yes in the Devolution Referendum by 52%, but were denied devolution, because the Labour Government at the time decided to make the rules such that over 40% of the electorate would have to vote for it, for the referendum to be successful. In 1989, the passage of the Claim of Right was another big moment in Scottish modern history. The Claim of Right was signed by 58 of Scotland's 72 MPs at the time, 7 of Scotland's 8 MEPs and 59 and out of 65 of Scotland's councils as well as numerous political parties, churches, civic organisations and trade unions. This new legislation meant that it would now legally be for the people of Scotland to decide their constitutional future. It was the Claim of Right that led to Scotland's eventual devolution, and the opening of the Scottish Parliament in 1999. The devolution referendum of 1997 produced a 74.29% yes result for the opening of the parliament and 63.5% voting for tax raising powers. By the time David Cameron had agreed to legislate for the first independence referendum, support for independence was believed to be polling anywhere between 20%-30%. It was widely believed that the UK Government expected to win the referendum by a landslide and had not expected such a close result. Of course, we all know the result of that referendum. However, what's sometimes forgotten, is that polls in the last few days of the referendum suggested that yes had taken the lead. And then of course, we saw the the British Prime Minister begging the people of Scotland to stay in the union, and promising further devolution of powers to the Scottish Parliament in return for a no vote. So the question had effectively changed from a yes/no question to - do you want independence, or will you settle for more devolution for now? On the day of the referendum, the people of Scotland were presented with 'The Vow' which was signed by the leaders of all three of the main English political parties - the Lib Dems, Labour and the Conservatives. 'The Vow' is widely believed to have swung the vote in favour of the union. Either way, the UK Government's last minute intervention was absolute proof that they knew the number was up - that Scotland was no longer content with the status quo. The UK Government had been reduced to begging us to stay. Those swayed by the promise of more powers were always going to demand more devolution eventually. That time is rapidly approaching. A couple of years after the independence referendum took place, along came the EU referendum. 52% of the UK as a whole voted to leave the European Union, while Scotland voted massively to remain (by 62% to 38%) and England had voted 54% to leave - a nightmare scenario for the British establishment, and for the union. Polling for independence began to produce consistent yes results in the immediate aftermath of the Brexit vote, and as we approach Brexit day, polls are again producing yes results - with 53% saying they'll back independence in the event of Brexit, and 59% saying they'd back independence in the event of the UK leaving the EU without a deal. The idea of Scotland regaining it's independence and taking control of her own affairs is not a new one. This desire for self determination has been brewing for a hundred years or more. The advent of the internet and social media has brought about a massive independence movement in Scotland, and one that is growing by the day. The Scottish National Party has so many members now, that it outnumbers the 2nd largest party membership in Scotland by almost ten to one. No other political party even comes close in terms of membership figures. Labour and the Tories have less than 15,000 members each in Scotland. The Green Party have 9,000. UK wide, the SNP is now the 2nd largest party in terms of membership with a massive 125,000 members, and the third largest party in terms of seats in the Westminster parliament in London. On the 6th of September in 2018, 100,000 Scots marched for independence, in the largest march of it's kind in history. 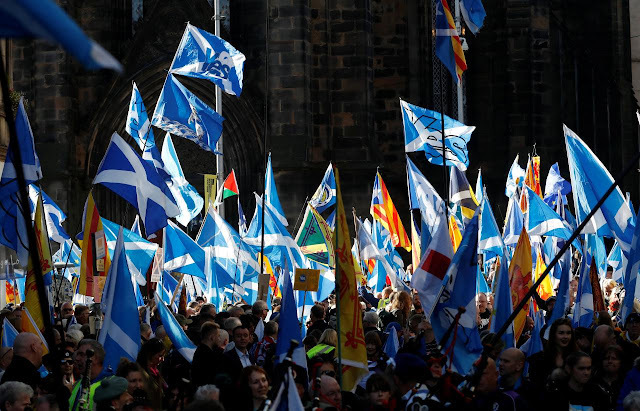 The march followed a season of successful marches, fronted by All Under One Banner - an organisation that plans to keep marching until Scotland achieves independence. The numbers had got so big that the unusual decision was taken by Police Scotland NOT to release an official crowd estimate for the march - instead an estimate that was made at a council meeting prior to the event was released to the media. When I contacted Police Scotland to ask why they had not released their official figure, they refused to respond - perhaps orders from above? When #DissolveTheUnion began to trend on Twitter, the media did their best to dismiss the movement by claiming that Twitter bots had been set up, and that the people using the hashtag were not even human. When they accuse the SNP of being obessed with independence, they're talking about a million human beings - in the 2015 election, 1.4 million people voted for the SNP. So when they say that the SNP won't shut up about independence, what they're actually saying is that Scotland won't shut up about independence. We won't shut up, we won't go away and we won't back down, until we have what's rightfully ours - our right to self determination - our right to be a normal independent country. This is a movement that has been brewing for a long time. Scotland will be reborn as a proud, independent nation. This is a movement that is growing in numbers by the day. This movement will not end until Scotland declares independence, and I suspect even afterwards, it will mobilise in order to protect and defend that independence. According to one of the world's most respected economists, Scotland could "not only survive on it's own, it could thrive on it's own." You will not however hear any of this from mainstream media outlets in the UK, and I think it's pretty obvious why. As pointed out by economists, change is not good for the establishment and it's also not good for corporations which rely on the status quo, so for quite obvious reasons, they'd quite like to keep things as they are. It is therefore in the interest of the establishment to continue their onslaught of negative and biased unionist propaganda, in order to prevent Scotland from taking it's rightful place on the world stage. 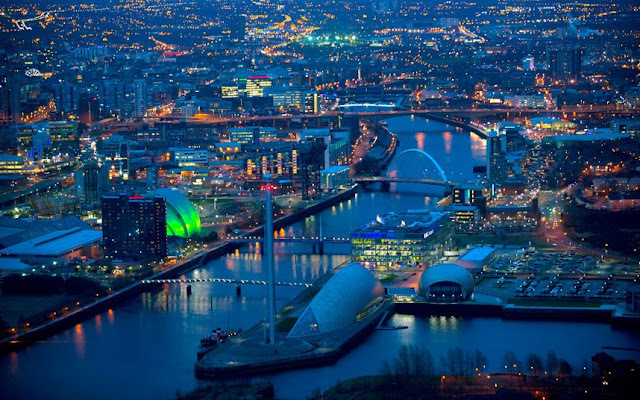 Above, one of the world's most respected Irish economists David McWilliams explains why Scotland would thrive as an independent nation, and why the economic potential of Scotland is actually in a stranglehold while it remains a part of the UK. McWilliams is well respected because he also correctly predicted the global financial crash of 2008. Now of course, this was not reported in UK media, but on Irish news. Interestingly, he also predicted in this video, that the Scottish independence vote would change Scotland's relationship with the UK Government forever. An article in the Independent newspaper a couple of years ago, explained exactly why Scotland has all of the ingredients to become the world's richest country on a per capita basis. It is no secret that in recent months, now that the perceived threat of Scottish independence is off the table, the media have openly admitted that Scottish oil is in fact a massive asset. The oil is good for at least the next 50 years according to The Scotsman newspaper recently. This is despite the fact that in 2014, Scots were told the oil could run out within a decade. Actually, any time the issue of Scottish independence is discussed, the mainstream media immediately publish articles that downplay the value of Scottish assets. Some mainstream media outlets like Channel 4 for example, even claimed that the oil and gas reserves are worth only £120 billion rather than the £1.5 trillion figure that was banded around by the independence campaign in 2014. However, in the years since, BP have now openly admitted that Clair Ridge is a real project and have now started drilling - in 2014, Salmond was labelled a conspiracy theorist for discussing this project, which will be targeting 640 million barrels of oil according to BP. So that low estimate perpetuated by mainstream media at the time of the first referendum was quite clearly a deliberate deception. 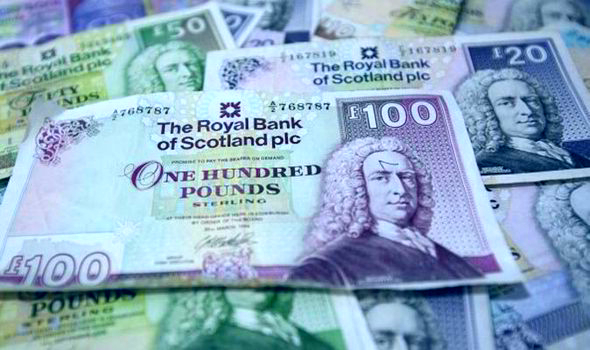 A BBC article recently valued Scots personal wealth at being worth over a trillion pounds. Mark Carney, Governor of the Bank of England told a press conference before, that "the broadbrush assets of the Scottish financial sector" is worth at least "ten times GDP," and admits that to be "north of a trillion pounds sterling." Currently, that equates to over £1.8 trillion. Now, ask yourself why there have been no headlines about any of this in the British mainstream media? So what is the secret to being the wealthiest country on earth on a per capita basis? Well that's simple - have a lot of wealth, and share it with a relatively small population. Let's look at the list of the world's wealthiest countries right now per capita, and it doesn't take a genius to immediately figure out that they all have a very small population like Scotland. Actually, having a massive population is a bad thing economically per person. Having a small population is therefore better. So the whole argument that you could be "too small" to be independent is quite silly really. Being a smaller country, means that there is more accountability and less opportunity for state corruption. Being smaller also makes it easier for a nation to remain competitive and attractive to foreign investment and corporations. It is widely believed that Scotland could easily implement the Irish model of reducing corporation tax slightly in order to attract huge American multinational corporations to set up home in Scotland, which would bring tens of billions of pounds into the Scottish economy, and would also provide excellent jobs with excellent pensions and benefits to thousands of workers who are currently undervalued in the UK's low wage economy. Economists have pointed out that Scotland would have the ability to be even more competitive in this area, because our wages are so low compared to other countries. Scotland already has a higher GDP Per Capita than France, Spain, New Zealand and Japan. So if you're saying that Scotland isn't rich enough to be independent, then you're also saying the same about France, Spain, New Zealand and Japan, and that is frankly ridiculous. Business For Scotland revealed once how the British Government deliberately mislead the public into thinking that Scotland couldn't survive by fudging the financial figures. The British Government commissioned The McCrone Report, which was supposed to find that Scotland couldn't survive as an independent country, but much to the horror of the Government, it revealed the opposite was true, that Scotland would have been one of the richest countries on earth by now, with one of the world's strongest currencies. The British Government then buried the information for 30 years, because they feared that if the people of Scotland knew the true economic potential, that they'd immediately demand independence. A Forbes article actually concluded that the British Government have been deliberately misleading the people of Scotland for decades in order to keep Scotland under control. Any sane human being would conclude that the British Government will do and say anything to protect Scotland's place in the union, in order to protect the UK's place as one of the world's biggest economies. Given that the Scottish economy represents roughly 10% of the UK economy as a whole - losing Scotland would mean a massive hit to UK GDP, and the UK would immediately fall a few places in the world rankings. When you really think about it, it's the UK that has everything to lose, and Scotland has everything to gain. As you can see by studying the table above, the UK would lose the vast majority of it's assets if it were to lose Scotland. The UK would lose oil reserves, gas reserves, hydro power, farmland, sea area, forestry, fishing waters, tourism income, export income etc. Scotland is simply put, an asset to the UK Government. 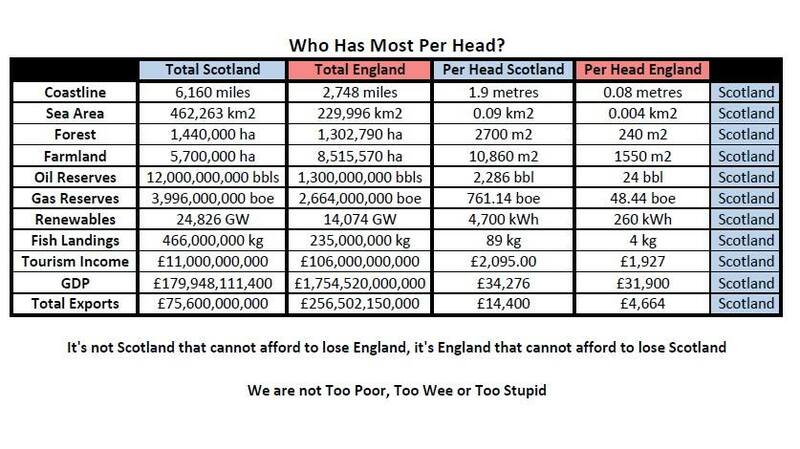 Scotland is the UK's greatest asset in fact - the jewel in the crown of their Empire. The question is, just how much longer will they manage to hold onto this prized asset? Scotland is a rich country, with trillions of pounds worth of natural assets, trillions of pounds worth of personal wealth, and a finance sector worth trillions of pounds - so of course, it makes sense that they don't want to lose us. On a per capita basis, it is perfectly true that Scotland could potentially become the richest country on earth in the aftermath of independence. But there's absolutely zero chance of that happening while Scotland remains a part of the United Kingdom. Economic growth is due to be so badly hampered by Brexit, that the economy of France will overtake the UK's within a year. India is due to become the world's 5th largest economy next year, and France will take 6th place, beating the UK into 7th position according to the IMF. But India had already been predicted to outpace the UK no matter the resulting fallout from Brexit. As reported by Forbes recently, economic growth in India has never slowed in a century, and has grown around 7% a year since Prime Minister Narendra Modi and the Bharatiya Janata Party took office. India was blighted by poverty when their economy was devastated by British rule. Poverty levels were as high as 70% when the British pulled out of India. 70 years later, the poverty level is now 22% according to the Indian Government. And today, the Daily Mail reports that France will overtake the British economy shortly afterwards. However, the Centre for Economics and Business Research actually predicts that the UK economy will recover after Brexit in the longer term, and they say that even if they lose Scotland and Northern Ireland, they will overtake France again by 2026. At present, the United States remains the largest economy in the world, but China is looking to overtake the US by 2032 according to the CEBR. 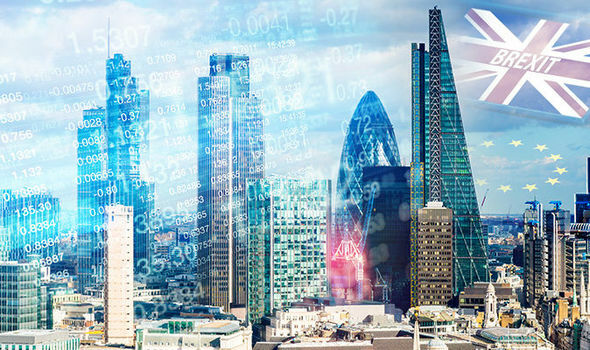 All forms of Brexit are predicted to be harmful for the British economy, and potentially devastating, at least in the short term. But the worst case scanario, according to economists, would be for the UK to crash out of the EU without a deal. ForeignPolicy.com predicts that this outcome could potentially destroy the economy in the short term. In the short term, losing Scotland would mean a £200 billion hit to UK GDP. While not being independent, Scotland sadly remains too risky to attract significant foreign investment, or to compete with the likes of Ireland to attract huge multinational companies that could potentially bring tens of billions of pounds into the Scottish economy, as corporation tax rates are controlled by London. 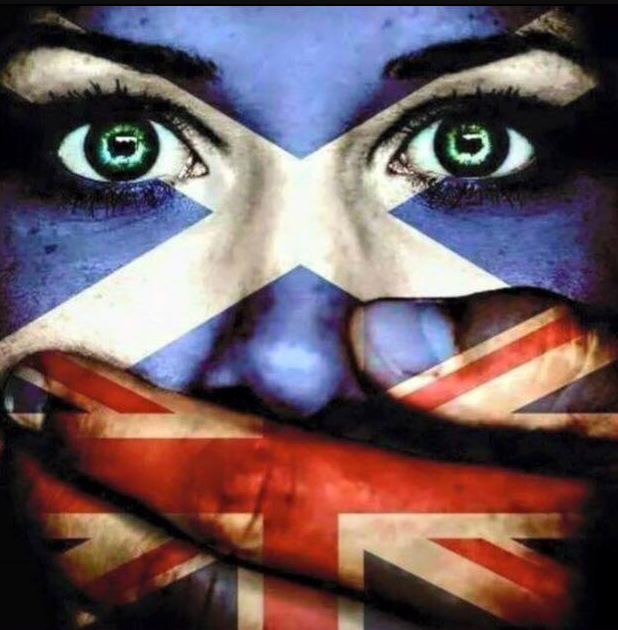 The sad truth of the matter is that under the current political system in the United Kingdom, the voice of the Scottish nation has been silenced for over 300 years by the Act of Union. Even if every single person in Scotland voted for the same party on a single issue, and all 59 Scottish MPs took that issue to the Westminster Parliament in London - the will of an entire country could then be vetoed by the 533 MPs that represent England. 473 English MPs could stay at home, only 60 would be needed to defeat any Scottish motion. There are more MPs in London than there are in the whole of Scotland. There are 73 in London - so even the city of London has a bigger voice in Parliament than the entire country of Scotland. Scotland is ruled by a foreign government - that was not elected by the people of Scotland. Any legislation passed in that Parliament then goes to an unelected House of Lords, and is then signed off by an unelected, hereditary Head of State - currently Queen Elizabeth II. It's time we in Scotland came to accept an uncomfortable truth - the people of Scotland have absolutely zero authority over our own affairs - all authority lies with a government we didn't elect, Lords and Ladies we didn't elect and ultimately, and perhaps most bizarrely, with Kings and Queens we surely didn't elect. It's time we had a good think about who's running our country, and it's time we realised that while we are within a political union that effectively hands all authority over Scottish affairs to a foreign government, we will never be able to build the kind of country we want to build. Scotland has a parliament building, that has no authority over constitutional matters. Our Parliament's authority has been overruled by Westminster on countless occasions, and more worryingly, our legal system has been overruled by London. This is no longer a political union. This is a dictatorship. I recently visited the Scottish Parliament and I was struck by the words told to me by a lady who welcomed us into the Parliament. She told me "this is your Parliament - it's owned by the people of Scotland." It got me thinking, that Westminster Palace is legally owned by the Queen - and that the Scottish Parliament is owned by the people of Scotland - and made me realise, that's what makes us different. If Scotland were independent, we'd be a democracy, where the voice of somebody on the Shetland Isles would be just as important as the voice of someone in Glasgow or Edinburgh. The United Kingdom is a constitutional monarchy, and not a democracy. Scotland would be a democracy, where laws would be passed by Parliamentarians, not by Lords and Ladies or Kings and Queens. Isn't it time that the people of Scotland got some self respect, and got up off their knees, and stopped begging to be heard by an ancient British establishment that will never respect us? Isn't it time we started to value the voices of the people in our own country over the voices of an elitist system in a foreign country when it comes to the most important things that affects Scottish society? Isn't it time we realised that instead of obeying the desires of the representatives of London, Manchester, Birmingham, Newcastle and Liverpool, that we should actually value the voices of those living in Glasgow, Lanark, Edinburgh, Renfrew, Ayr, Fife, Stirling, Aberdeen, Dundee, Dunbarton, Perth, Midlothian, Angus, West Lothian, Dumfries, Inverness, Argyle, Ross and Cromarty, East Lothian, Banff, Moray, Roxburgh, Clackmannan, Wigtown, Kirkudbright, Kincardine, Berwick, Caithness, Selkirk, Orkney, Shetland, Bute, Peebles, Sutherland, Nairn and Kinross?